A revolving fund enables Auckland to invest money flowing from municipal energy-saving projects into additional energy efficiency improvements. Auckland uses a revolving fund to finance projects in its Energy Management Program, which implements energy efficiency upgrades in city-owned or managed buildings. The fund was first granted $700,000 in 2013 to invest in innovation and improvements of public-owned buildings; the savings achieved by the gains in efficiency have been reinvested in additional projects. To date, the retrofit of the Auckland Council Headquarters led to a 39% in energy reduction and annual savings of $377,000. Additionally, the city’s outfitting of 40,000 streetlights with LEDs, and the addition of a tele-management system, will result in a total net savings of $30 million over 20 years. As the Council has 1,816 buildings under its jurisdiction, they have a wide scope to scale up improvements and achieve important savings via the revolving fund. In addition to addressing the climate-proofing needs of city-owned buildings, the project demonstrates the viability of energy efficiency investments and can act as a guide for the building industry and building owners across New Zealand. Without intervention, Auckland’s greenhouse gas emissions could increase by 46% by 2025 and energy use by 65% by 2040. Moreover, the city spends nearly 5% of its gross regional product on energy. Through the revolving fund mechanism, Auckland is curbing its energy use and demonstrating that significant savings and efficiencies can be gained while minimizing costs for taxpayers. Economic A staff satisfaction survey in the Council headquarters found that, within the first year of occupancy, personal productivity is up 8%. 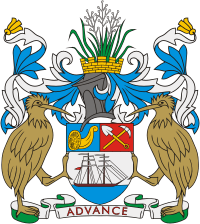 Environmental The headquarters of Auckland’s Council has achieved a 25% reduction in water use through installation of intelligent delivery systems included in its retrofit program. Health Thirty to 65% of night-time accidents can be attributed to the quality of white versus yellow light and their respective impacts on reaction time. The Council hopes to improve road safety with the adoption of LED streetlights. Auckland is a city in New Zealand’s North Island. With an urban population of 1,495,000, Auckland is the most populous urban area in the country. Auckland’s Central Business District is the major financial centre of New Zealand and its surrounding hills are covered in rainforest and the landscape is dotted with dozens of dormant volcanic cones. 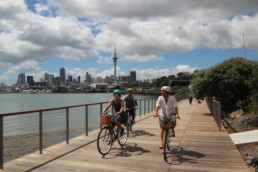 Auckland is frequently ranked among the world’s most liveable cities.